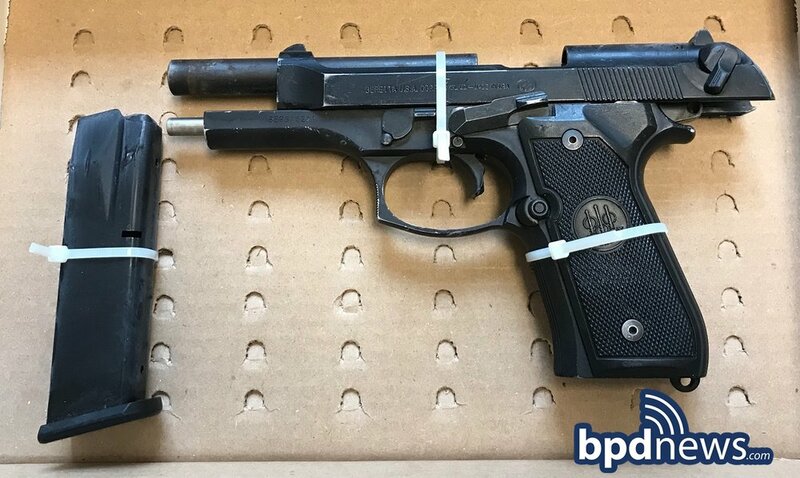 SUSPECT IN CUSTODY: At about 8:22 PM, on Monday, October 1, 2018, officers assigned to District D-14 (Brighton) arrested Nikyba Green-Burke, 30, of Boston, after responding to a call for a person with a gun in the area of 1441 Commonwealth Avenue. While on approach, officers were advised that a male suspect had entered a store and demanded cash from the register while displaying a firearm. On arrival, officers observed several community members struggling on the sidewalk with a male who matched the suspect description and also observed a firearm nearby on the ground. Officers quickly secured both the suspect and the firearm which was determined to be a loaded 9mm Beretta Model FS handgun (see photo). Officers were able to recover and return an undisclosed amount of cash that had been stolen during the incident. The suspect will appear in Brighton District Court on charges of Unlawful Possession of a Firearm, Unlawful Possession of Ammunition, Carrying a Loaded Firearm, Possession of a Large Capacity Feeding Device, Armed Robbery and Assault and Battery.